This is just a quickie to let everyone know that I am still working on my immediately pre-Beeching version of the Chiltern Line. There was a long thread, now long locked, about this on the UKTrainSim Forum. The route covers the two lines through the Chilterns, the old GWR/GCR joint line and the old GCR/Metropolitan joint line together with many ancilliary lines that either branch from, cross or run parallel to one or other of these main lines. The GWR/GCR line runs from Cropredy just north of Banbury to Marylebone via Princes Risborough and High Wycombe while the GWR/Met line runs from Woodford Halse to Marylebone and Baker Street via Aylesbury, Amersham and Rickmansworth. Also included is the line from Banbury to Didcot, the Met branches to Uxbridge, Watford and Chesham, the branch from High Wycombe to Maidenhead, the connecting lines between the two main lines from Banbury to Culworth Junction, from Princes Risborough to Aylesbury and from Ashendon Junction to Grendon Underwood Junction, the Piccadilly line from Acton Town to Uxbridge (which joins the Met at Rayners Lane), the Central line from North Acton to West Ruislip and Ealing Broadway together with the parallel west of England line from just west of Old Oak to Southall, the branch from Southall to the docks at Brentford and the Bakerloo (as it was in the timeframe of the route) from Baker Street to Stanmore. All trackwork is in place, the stretch from Banbury to High Wycombe is fully sceneried, and many custom built stations are finished. All the stations on the GWR/GCR joint line are complete, the Central Line stations are done, Piccadilly line stations from Acton Town to South Harrow are complete as are all the stations on the section of the Bakerloo that I have modelled. I am currently working on the stations on the Metropolitan. I have finished all the stations from Baker Street up to and including Harrow-on-the-Hill and am now building the Uxbridge underpass just north of Harrow before embarking on building the stations needed for the Uxbridge branch. Apart from those in the fully sceneried part of the route, I have built one or two other necessary scenery objects, including the former power station at Neasden depot and the GCR engine shed also at Neasden. As I work my way along the route I have also built custom bridges where stock items are not adequate for the track/road layout. I hope to post some screenshots in the fairly near future. This update gives a massive and welcome insight into how the route is taking shape. Living close to part of it as I do, it will definitely be a must have as and when it is ready. I always followed the UKTS thread on this route and marvelled at the extent and detail. Such good news to hear that it is still progressing, and I look forward to seeing any screen shots. I haven't tried attaching any screenshots before, so here goes with my first experiment. This is a shot of the Metropolitan line platforms at Baker Street. And many thanks for your encouraging replies. Could one of you who downloaded my screenshot of Baker St let me know if the image was uploaded OK? If so, I'll upload a few more screenies. Yes, it was received OK. Here's another couple of screenshots, picked out pretty much at random. The first is of West Ruislip station, terminus of the Central Line and penultimate BR station in the London direction of the GCR/GWR joint line. BR tracks on the right, Central Line tracks on the left. The second is of South Ruislip station, which is the final BR station before Northolt Junction, where the old GCR heads off for Neasden and then Marylebone and the old GWR continues straight on to Old Oak and Paddington. 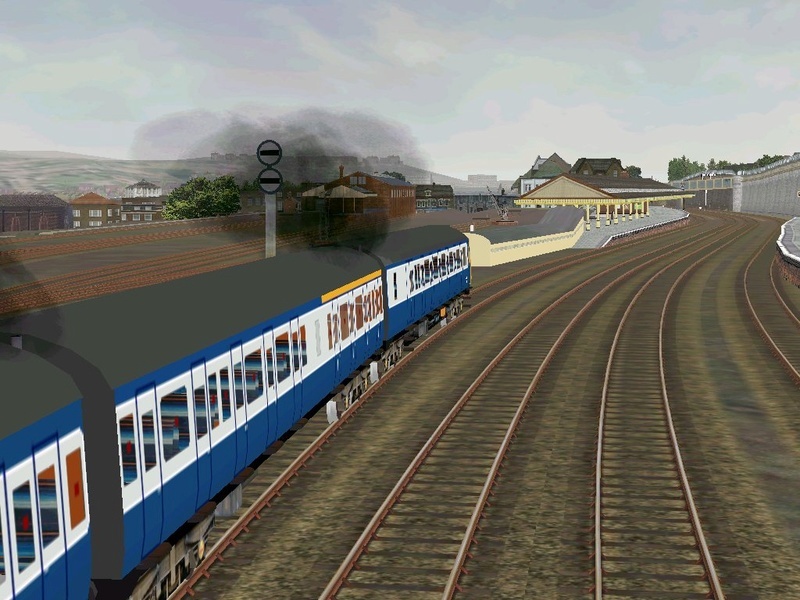 Although I have posted in the MSTS forum, when if ever I release the route, I will do so for Open Rails. I have a number of reasons. First, in some places my signals do not light up properly when running in MSTS (even though I am using MSBin) whereas there are no problems in OR. Second, it would be nice to include working turntables. And finally, my understanding from posts in the Elvas Tower forum is that it is possible to have more than one carspawner in OR. I shall have to experiment with this at some point since more than one carspawner means that one can have buses running in only the locations that are correct for them, thus avoiding, for instance, having London buses running in Oxfordshire and so forth. These are two more lovely screen shots which show off your route to great advantage. I will look forward to more information etc. as and when you make it available. The separate carspawners is something that I have been thinking about for use in the Dorset Coast Route as as you said you don't want London buses running out of their normal area. There is more on this in the Open Rails Manual - all of it is well worth reading to understand all the functions and their use as well as using Open Rails. With the line at his point cut into the side of the valley of the River Wye, there was not a great deal of room for the station so the platforms at High Wycombe are staggered and there is a huge retaining wall. You can see the subway connecting up and down platforms in the centre of the shot.